Famous people born on APRIL 8 are awesome Aries! No doubt… they are exceptionally resilient and they don’t say no to anyone for anything. They are able bodied and mindful of the things that they were taught as a child. They put their time to good use mainly to help others but they don’t let anyone take advantage of them. They keep their head up in times when others are down in the dumps. They know there is a brighter day coming. As a friend, they are most valuable and trusted. 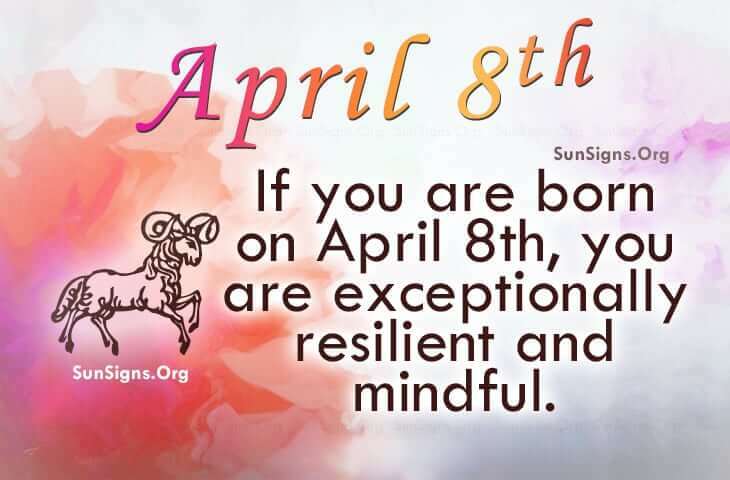 However, famous people born on April 8th have another side and that person is not able to tolerate foolishness or idleness. Aries as a lover can be the epitome of romance. They are fun to be around yet serious and gentle when they need to be. The ideal love match is someone just like them but let’s face it, there’s no one like that. So, they need to accept others unconditionally. Famous people born on April 8th have a sharp business mind. Alternatively, they love a good joke or prank. They are turned off by lazy people but are intimidating. Aries born on this famous birthday are selfish individuals but won’t accept help. However, they are a good friend.